Now that the sun is back and the weather is warming up, it’s time to dust off those golf clubs and hit the links again. 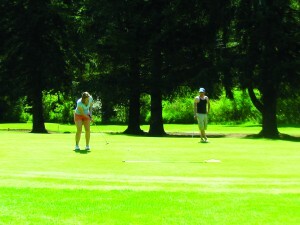 And the Vernonia Golf Club is just the place to head. Owners, and brothers, Nick and Bob Zavales took over the nine-hole club two years ago and have been doing a great job sprucing up the place and getting ready for another great season. Bob and Nick say the course is in “phenomenal shape” right now; the greens are alive and putting really well and things are dry throughout. During the winter of 2012 the Zavales’s thinned a number of large trees which opened up the course quite a bit and allowed a lot more sunlight to reach the grass and dry things out. “Our regular players tell us it’s a big improvement,” says Nick. A new gravel cart path was another major improvement. Some newly installed culverts have also helped improve drainage. The club has hosted several tournaments including the annual “Midnight Madness” tournament on July 3rd. Play starts at dark with glow-in-the-dark balls and has been a highlight of each of the past two seasons. The Vernonia Rural Fire Volunteers will also hold their fundraising tournament on the Sunday of Jamboree weekend, starting at 7:00 AM. A Men’s Club continues to meet every Wednesday evening, a chance to play with locals and other players. 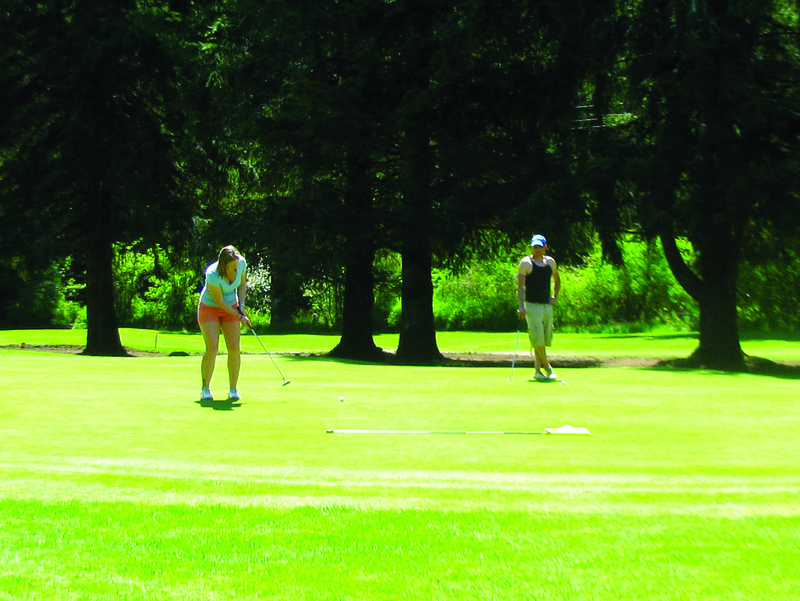 The Club also hosted the Vernonia High School Golf Team for practice all season. 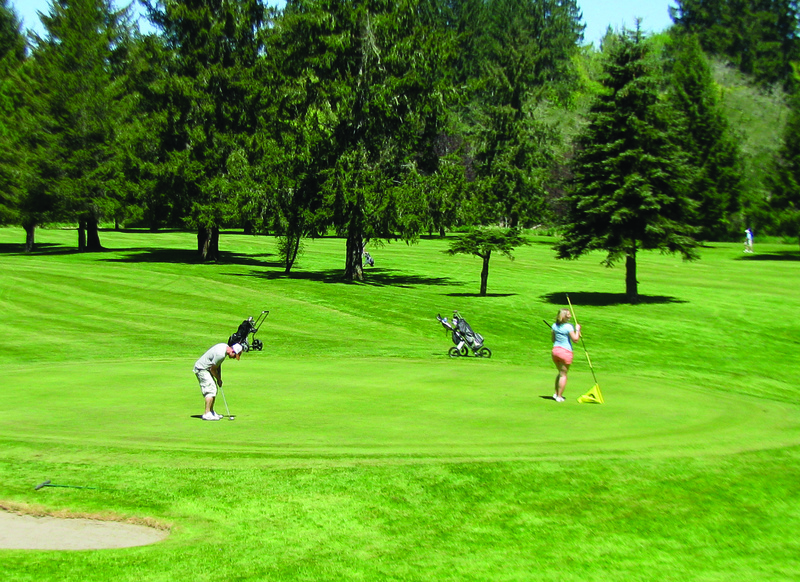 You don’t have to play golf to enjoy the Vernonia Golf Club. The Club House is seeing a lot of activity. The restaurant features breakfast and lunch as well as a full dinner menu on Friday nights, including steak, seafood, pasta and prime rib. The regular menu has burgers, hot dogs, sandwiches, chicken strips and other items. They are currently serving beer and wine. The clubhouse is also available for private parties, including class reunions, family gatherings, business meetings and more. Prices to play remain a great deal: $12 for nine holes, $20 for eighteen on weekdays; $14 and $24 on weekends; $2 off for seniors and junior players. Pull carts and power carts are available for rent. Memberships are also available: $550 for an annual unlimited membership, $950 for a couple, (and you don’t have to be man and wife, so grab your buddy, sign up and save a few bucks!) $400 for weekdays only, non-resident outside thirty miles is $475. The course is in great shape, the restaurant and bar are open and the weather is great. So head out the Vernonia Golf Club and enjoy!